Floyd Mayweather Jr., a boxing champion who boasts a 42-0 record in the ring, has repeatedly missed jail time for domestic violence cases in Las Vegas and Michigan. His streak of no jail time has finally come to an end as a judge in Las Vegas sentenced him to 90 days in jail after Mayweather pleaded guilty to reduced battery domestic violence charges. Mayweather also pleaded no contest to two harassment charges against him. The case is from a hair-pulling, arm-twisting and punching incident with his ex-girlfriend, Josie Harris. The incident occurred while two of their children looked on back in September of 2010. “Punishment is appropriate. No matter who you are, you have consequences to your actions when they escalate to this level of violence,” she said. 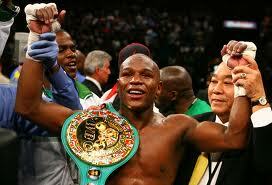 Should Mayweather exhibit good behavior, his sentence could be reduced by a couple of weeks. It is more likely that he will serve the majority of his sentence, which is scheduled to begin on January 6, according to Officer Bill Cassell, a spokesman for the Las Vegas police. Leonard Ellerbe, Mayweather’s agent, and Mayweather declined to comment after the courtroom appearance. The jail time for Mayweather puts in jeopardy his scheduled fight with Manny Pacquiao, who is a champion fighter hailing from the Philippines. Mayweather’s welterweight success is typically measured against Pacquiao. A fight between Mayweather and Pacquiao has been postponed for quite some time now as there have been stalling techniques and verbal sparring committed recently. There is a defamation lawsuit pending in Las Vegas Federal Court involving the two men. Mayweather told media outlets that he thinks Pacquiao has taken performance-enhancing drugs. It is also expected that Mayweather will plead no contest to a separate misdemeanor harassment charge that involves a 21-year-old homeowner association security guard. The guard was poked in the face in the middle of an argument about parking tickets on cars that were parked outside Mayweather’s home. The lawyer for Mayweather, Karen Winckler, told the court of all Mayweather’s good deeds, which include purchasing toys for children for Christmas and promising to donate $100,000 to breast cancer research. It was argued by Winckler that if Mayweather were to perform 100 hours of community service instead of 90 days in jail, the community would benefit more. Mayweather also owes the Las Vegas Habitat for Humanity Project 40 hours of community service. Mayweather was sentenced to the 40 hours by a federal judge from South Carolina because Mayweather missed a deposition in a music rights lawsuit. There is a January 31 deadline for that court order for Mayweather. Catherine Barnes, a Habitat for Humanity official, said that Mayweather has not begun logging his hours yet.